Our next major photopost will be for Corpus Christi, which is celebrated either tomorrow, May 31, or this coming Sunday, June 3. Please send your photos (whether of the Ordinary or Extraordinary Form) to photopost@newliturgicalmovement.org for inclusion. Of course, we are especially glad to include pictures of Eucharistic Processions, one of the major staples of this feast, but also those of celebrations in other rites, as well as Vespers and other parts of the Office. For the past four years, we received enough submissions to make three separate posts - let’s keep this tradition going! Please be sure to include the name and location of the church, and always feel free to add any other information you think important. Evangelize through beauty! 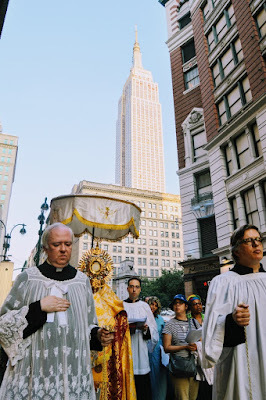 From our second Corpus Christi photopost of last year, a particularly good shot by one of our regular contributors, Mr Arrys Ortañez; the Eucharistic procession in Manhattan from the church of the Holy Innocents.